The 2018 World Series of Poker (WSOP) kicks off on May 30 with the $565 Casino Employees No-Limit Hold’em event. Thirty-four days later, on Jul. 2, the $10,000 Main Event shuffles up and deals and you could be playing in it for free, yes nada, zilch, nothing. Here’s how. 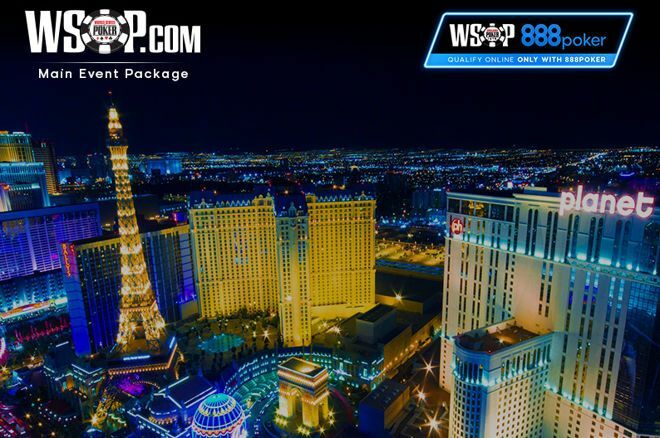 888poker is the official sponsor of the 2018 WSOP and that means it is the only online poker site that can offer satellites into WSOP events, including the Main Event. To celebrate the start of what is the 49th annual WSOP, 888poker is giving PokerNews readers the chance to win a $12,600 package to the 2018 WSOP Main Event for free. Daily freerolls called Satellite Special WSOP Main Event Package run at 9:00 p.m. CET and award at least one $55 ticket to the Special WSOP Main Event package tournament, which commences at 10:30 p.m. CET on Jun. 10. Each of the freerolls allows for up to 20 rebuys of $1 each and it is possible to purchase an add-on for $1 once the rebuy period ends. At least one $55 ticket is guaranteed by 888poker and the site will put another ticket into play for each $55 in the prize pool. Those of you who manage to win yourself a $55 ticket to the Special WSOP Main Event Package tournament have a legitimate chance to bag yourself a $12,600 WSOP Main Event package. Players in the Jun. 10 tournament start with 5,000 chips and play to 12-minute blinds. Eight rebuys of $55 each are allowed, plus there is the option to purchase 10,000 more chips at the add-on break, also for $55. The freerolls are only open to 888poker players who created their 888poker accounts via PokerNews’ links and who have made at least one deposit into their accounts. Head to the 888poker tournament lobby (under the restricted tab) and register for the next available freeroll if this describes you. If you already have an 888poker account but you did not sign up for it via PokerNews, you can always buy into the $55 Special WSOP Main Event Package tournament directly and see if you can turn $55 into a $12,600 package. For those who don't already have an 888poker account; we can help you with this. Download 888poker via PokerNews and you’ll receive $88 worth of cash and tournament tickets just for creating your account. Your initial deposit, when you make one, will be matched 100 percent up to a maximum of $888, which is the biggest 888poker bonus found online. The PokerNews Live Reporting team will be at the Rio All-Suite Hotel & Casino for the duration of the WSOP, including the 2018 WSOP Main Event. Will it be you who we are interviewing after becoming poker’s World Champion? There’s only one way to find out!